Kevin Bronson will join the Bulls’ 2014 recruiting class as the 29th commit. The 6-foot-3 235-pound defensive end initially signed with Virginia Tech on National Signing Day but ran into academic problems during the admission process. According to a report by ESPN, when Bronson committed to Virginia Tech his scores of 16 on the ACT in both English and Math were one point shy of the required score to be admitted. When Bronson was deciding between schools in February, he was assured that his low scores wouldn’t be a problem in the admission process. But as time wore on, school representatives were less assuring to Bronson. Eventually, the school informed Bronson he would not be admitted. After he was released from his National Letter of Intent, the Delray Beach native made the decision to commit to the Bulls, who had already made him an offer earlier in the year. At Village Academy High School, Bronson totaled 58 tackles, nine sacks and forced six fumbles in his senior season. His play earned a first-team Class 2A all-state selection, making him the 10th Bull in this year’s recruiting class to have earned first or second-team all-state recognition in Florida. 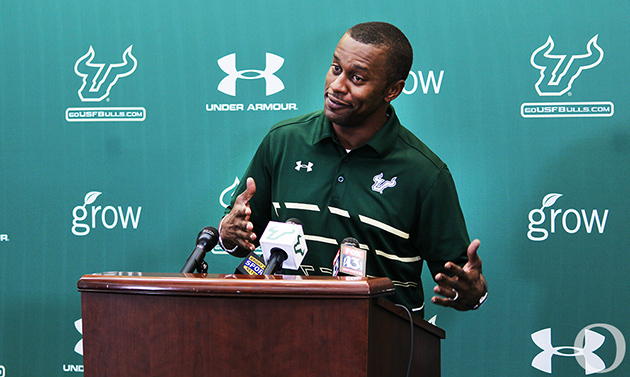 Coach Willie Taggart was pleased that the Bulls were able to add Bronson, even though he did not originally sign with the team. Bronson declined offers from Florida, South Carolina, Miami (Fla.), Arkansas, Nebraska, UCF and Vanderbilt to play for the Bulls. He’s ranked as a three-star recruit according to ESPN.com.